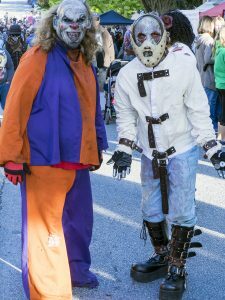 The zombies will be invading the south side of Cherokee County on Oct. 21 during the 2017 Georgia Zombie Fest and Food Truck Fair. The fifth annual event will take place noon-9 p.m. in downtown Woodstock. Just a week earlier, the zombie craze begins with the Zombie Fest 5K Walk, Run, Creep or Crawl, set for Oct. 14 at Etowah River Park in Canton. And, for those who can’t make it to Canton for the 5K, a virtual 5K is open to participants around the world. Registration details are available at www.GeorgiaZombieFest.com. More than 8,000 people attended last year’s Zombie Fest, which has become a popular fundraiser for Cherokee FOCUS, a local 501 (c) 3 nonprofit focusing on a variety of programs and initiatives for youths and young adults. During its 15 years, FOCUS has worked with hundreds of youths in their Cherokee Youth Works program, which focuses on education, work readiness and career employment for 16- to 24-year-olds. Throughout the county, FOCUS also targets youths and young adults through the Drug Free Cherokee initiative for drug prevention; watch for their prom campaign coming soon. Other initiatives for this collaborative include efforts in the area of literacy and their Hotel to Home track to permanent housing.